Avarra™ Lab Grown Alexandrite - 100% real Alexandrite (true Chrysoberyl), not color change sapphire or CZ. Top quality mined alexandrites over 1ct are among the most valuable of natural colored gemstones. 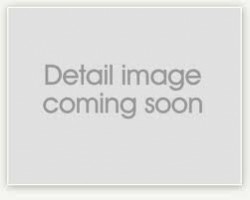 This is because their creation in the earth requires the combining of two minerals not usually found together, plus the absence of a third common one....thus, natural top quality alexandrite is hard to find, and expensive when you do come across one. 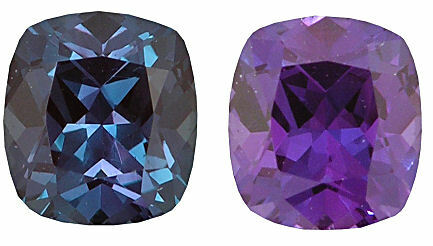 Alexandrite has been highly prized both due to its rarity but just as equally for its beauty - it features a unique color change phenomenon whereby it shows a bluish-green in daylight, and a purple-red in artificial light. 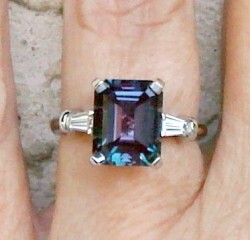 Thus, we are pleased to offer a limited selection of fine, lab-grown alexandrite at a mere $50/ct. These are grown in the lab via a floating pull method, and feature large sizes with the requisite stunning color change feature.